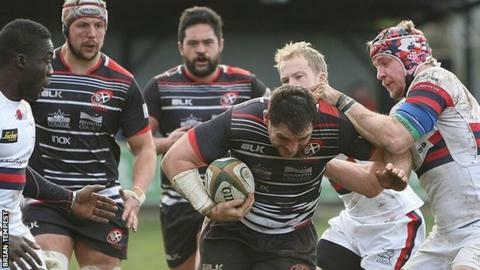 Cornish Pirates boss Ian Davies criticised referee Greg Macdonald after their 26-19 home defeat by Doncaster. It was the team's third consecutive Championship loss and left the Pirates ninth in the table. "Whoever put the ball in (the scrum) got the penalty, that's the way the world of rugby is going," said Davies. "Hopefully when we play them again we'll have a referee who understands the maul and scrum, because we didn't have that and it affected the game." Tries from Jack Arnott and replacements Jack Innard and Tyler Gendall earned Davies' side a losing bonus point. Declan Cusack kicked three penalties for Doncaster, who will meet the Cornishmen again in the last eight of the British & Irish Cup next month. "We're determined to win the cup because that's all we have left now - mathematically we can reach the top four but ultimately we're not going to get there," Davies told BBC Radio Cornwall. "There are some awful teams in the Championship who're going to finish below us and there are some better teams, more financed, that are going to finish below us. "There are teams who are probably not as good as they think they are who're going to finish above us - that's the nature of league rugby."